Are you excited about all of the peaches you see at the store and farmer’s market? After waiting for what seemed like forever for peach season to arrive, I have been totally digging it. 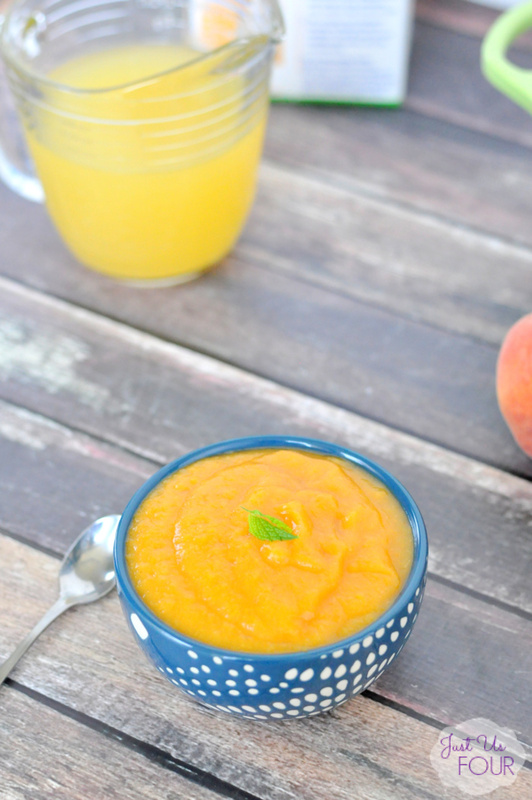 From pizza to appetizers, I have added peaches into lots of different recipes. 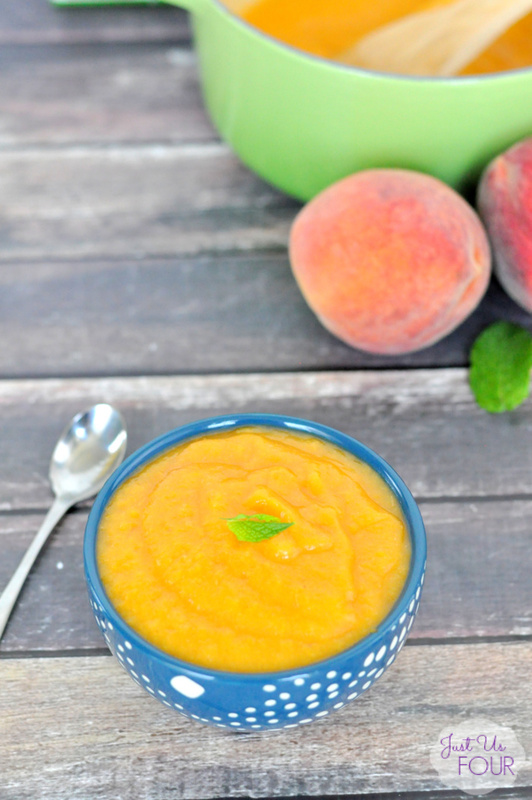 My latest: a roasted peach soup. Roasting the peaches before making the soup makes their sweetness really intensify. 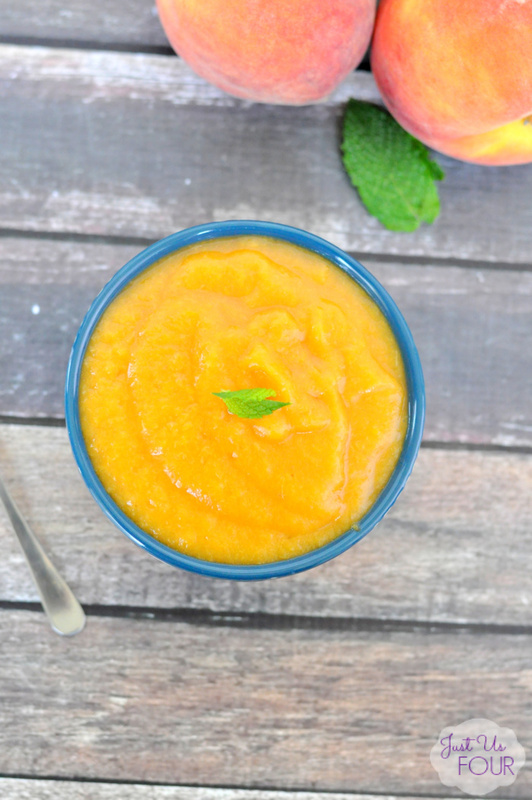 This soup is definitely best for small amuse bouche style portions because it is does have an intense flavor that screams “summer.” Of course, it is served slightly chilled because who really wants a hot soup during the dreaded heat of summer?! 1) Preheat oven to 400 degrees. Line a rimmed baking sheet with aluminum foil. Place peaches, cut side up, on the baking sheet and brush with melted butter. Roast for 10 – 15 minutes. Remove from oven and transfer to pot. 2) Add 1/2 cup chicken broth to the pot with peaches. Bring to a boil and then reduce to a simmer. Simmer for 10 minutes, using a spoon to break up the peaches. Add the remaining 1/2 cup of chicken broth. Using an immersion blender, blend soup until smooth. Refrigerate for 30 minutes. Serve topped with mint leaves. 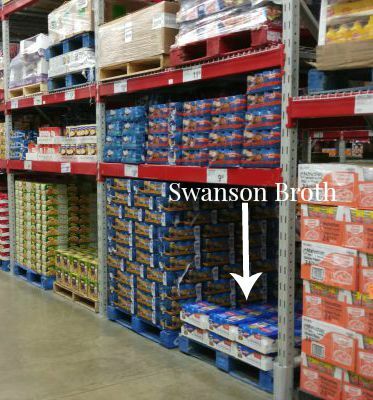 I use chicken broth all the time so I was excited to see that my local Sam’s club is now offering a six pack of Swanson chicken broth. There are also nationwide demos taking place on Friday, 31 July from 10:30am – 12:30pm. You can also visit the Swanson social site to find tons of creative recipe ideas that are perfect for summer and get more information on the Swanson Summer Sweepstakes. Preheat oven to 400 degrees. Line a rimmed baking sheet with aluminum foil. Place peaches, cut side up, on the baking sheet and brush with melted butter. Roast for 10 - 15 minutes. Remove from oven and transfer to pot. Add 1/2 cup chicken broth to the pot with peaches. Bring to a boil and then reduce to a simmer. Simmer for 10 minutes, using a spoon to break up the peaches. Add the remaining 1/2 cup of chicken broth. Using an immersion blender, blend soup until smooth. Refrigerate for 30 minutes. Serve topped with mint leaves. Yum! I’d never have thought of this, but it sounds really delicious. May have to give it a shot when my peaches are ready. Thanks for sharing. Looks yummy! Thanks for sharing with Small Victories Sunday Linkup. Pinning to our linkup board and hope you join this week’s linkup that just went live! Wow! 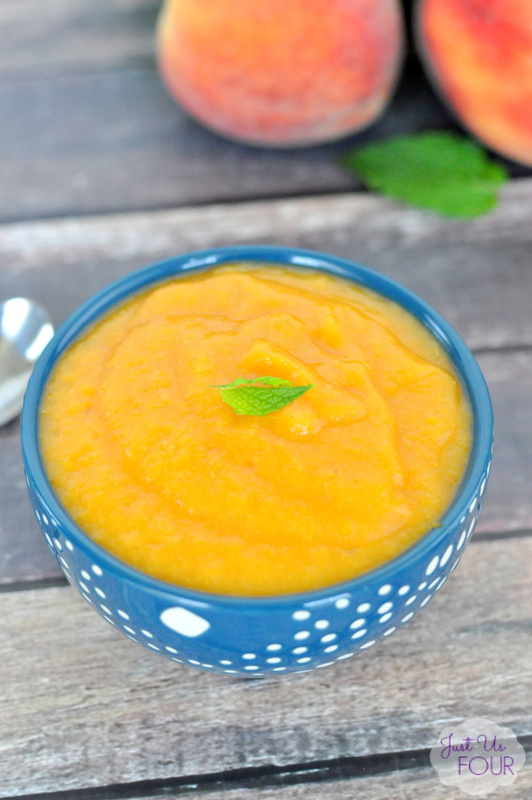 Roasted peach soup?! It looks soooo good. And your pictures are fantastic by the way! Thank you for sharing on #HomeMattersParty. This looks good! I know my kids would love it!